Get ready for spring with Xeomin® triple savings! Treat 1 area (using at least 25 units per area) and save $25, treat 2 areas and save $50, treat 3 areas and save $100. Plus, take $100 off the price of Radiesse treatment and get a $50 VISA gift card while supplies last! Get a “Lift & Glow” brow lift using Ultherapy® skin tightening, as endorsed by Christie Brinkley, for only $400 ($350 in savings). 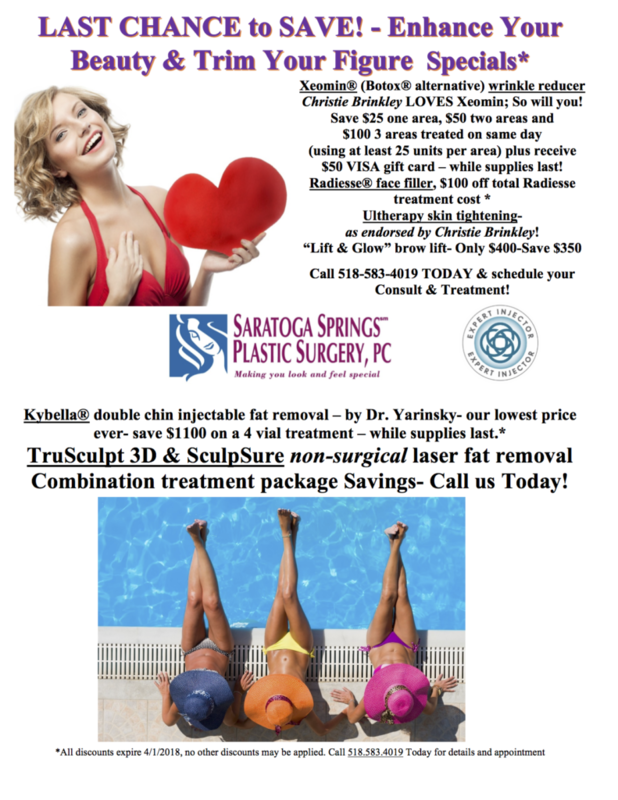 Additionally, save $1,100 on a 4 vial treatment of Kybella® double chin injectable fat removal and enjoy combination treatment package savings on TruSculpt 3D & SculpSure. Contact us today for more details and to schedule your appointment.